Mildred Farris is an esteemed leader throughout the sport of rodeo. As a competitor, Farris was Texas Barrel Racing Association’s champion barrel racer from 1955-1957, she earned a qualification twelve times to the National Finals Rodeo, was the runner up to World Champion in 1959, 1960, and 1969, and in 1968 she earned the fastest time at the NFR. Active involvement in the Girls Rodeo Association (predecessor to the Women’s Professional Rodeo Association) meant that for six years Farris served as Director, Vice-President, and President. The year 1955 marked her graduation from Sul Ross University, and the year of her marriage to John Farris. 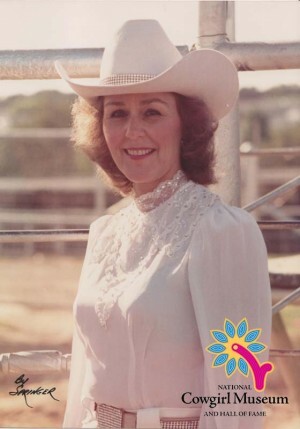 In 1958 she joined the GRA/WPRA, and since 1960 Farris has served as rodeo secretary for many top producers including Tommy Steiner, Harper and Morgan, Neal Gay, Jerry Nelson, and the Fort Worth Stock Show and Rodeo among others. Her dedication and contribution to the sport of rodeo as a secretary is noteworthy; she was named Secretary of the Year eight times by the Professional Rodeo Cowboy’s Association and received the same title in 1998 and 2008 by the WPRA. Additionally, Farris has been inducted into 3 Halls of Fame, in 1994, the Sul Ross Rodeo Hall of Fame, in 2004, the Texas Rodeo Cowboy Hall of Fame, and in 2006 in the Pro Rodeo Hall of Fame.